It’s been a scary day in New England today. The roads in Connecticut were closed at 1 PM. We’re all treed in our houses, and the worst of the storm hit at 6 PM (supposedly). The wind and the rain are howling pretty badly. Every second we have power, I’m grateful for. 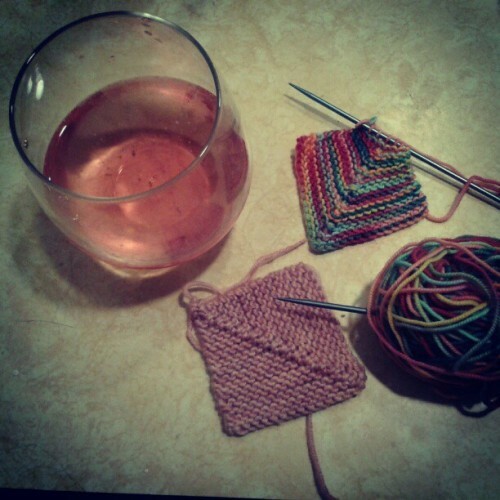 Barefoot Pink Moscato and squares from the Giant Sock Yarn Blanket. I started the Blanket a few years ago, but unfortunately the squares I made have gone missing. Ah well, no big shame, they’re fun to make and take almost no time at all per square.